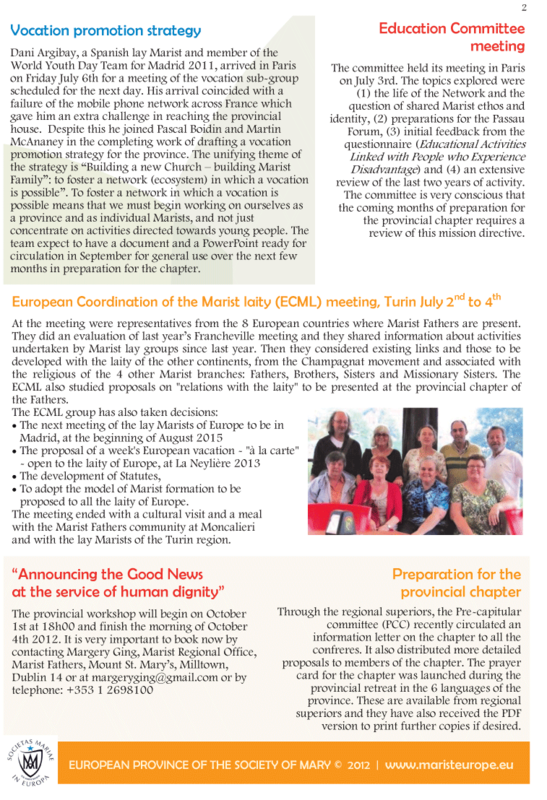 Leaflets in 40 languages concerning the Cause for Beatification of Marist Founder, Fr Jean-Claude Colin, are now available to the many persons coming from all over NSW to St Patrick's inner-city shrine, Church Hill, Sydney. 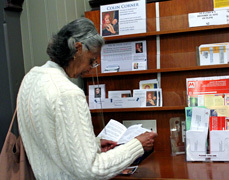 Featuring the 'Fr Colin Leaflet' in English and 'language of the week', the Colin Corner directs enquirers to the parish office and courtyard coffee shop for the multi-language stocks of the leaflet. When the 'Colin Year' commences in November, the Colin Corner will offer weekly reflection pages for use by laity. At 90 years of age Br Colin Campbell SM is the oldest member of the Australian Province of Marist Fathers and Brothers -- and a regular pastoral presence at St Patrick's courtyard coffee, Church Hill, NSW. .
Every Tuesday Br Colin is available for those coffee shop parents in need of a listening and sympathetic ear. 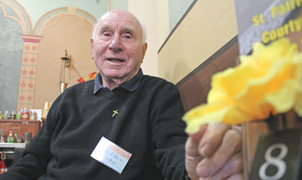 A veteran of World War II and wounded in Bougainville in 1942, Br Colin joined the Society of Mary hoping to return to the Pacific as a mark of gratitude for the 'fuzzy-wuzzy angels' to whom he owed so much. 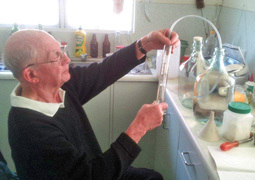 He worked in the Solomons for over 20 years and in formation houses of the Oceania province before rejoining the Australian province in his senior years. 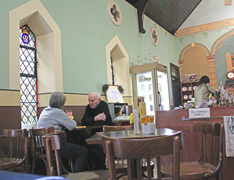 Br Colin was one of the pioneer volunteer staff of the Courtyard Coffee Shop, marking 10 years of service in 2011. Fr Kevin Medilo (back row in blue shirt) with MMR's computer class and their certificates / proud student with KoSoNo's assistant director Chayanin. 'MMR students were proud and delighted to receive the computer certificates from Thai government's Centre for Non-Formal and Informal Education (KoSoNo) Ranong province. 'The Centre's Assistant Director, Mr Chayanin, distributed the certificates to 33 students who successfully completed 60 hours of computer skills training. Leaflets in 37 languages are downloadable from this web site. Burmese, Kachin and Malay have been added to the growing list of languages for the biography-prayer leaflet of Marist Founder, Fr Jean-Claude Colin. 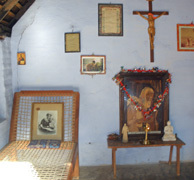 The leaflet is being made available in the languages of all peoples served by the Marist Fathers internationally as a means to promote awareness of the Founder's Cause for Beatification and an invitation to seek graces through his intercession. Current target for the resource is 60 languages. 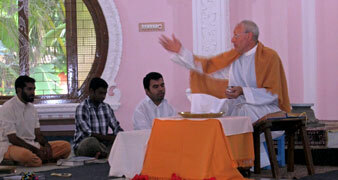 Fr Michael Whelan presiding at a liturgy during the Academy pilgrimage in 2011. Below: Memories of the 2011 journey. 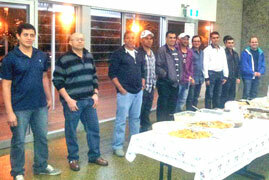 'There are already 24 pilgrims signed up, we will leave Sydney on February 1 and return on 21st. 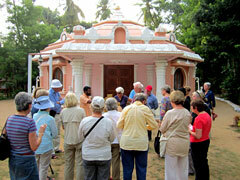 The centrepiece of the pilgrimage will be a retreat in the Saccidananda Ashram in Trichy. An important project in 2012 for the Marist community of Villa Maria, Hunters Hill, NSW, is the progressive refurbishment of Chanel House. 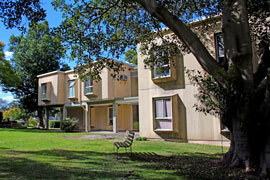 Originally a seminary student residential facility, the building is presently undergoing electrical upgrading as well as room renovations and re-carpeting. Chanel House will be used again this year for the Marist Asia-Pacific 'Spirituality & Lifestyle' program from October to December. 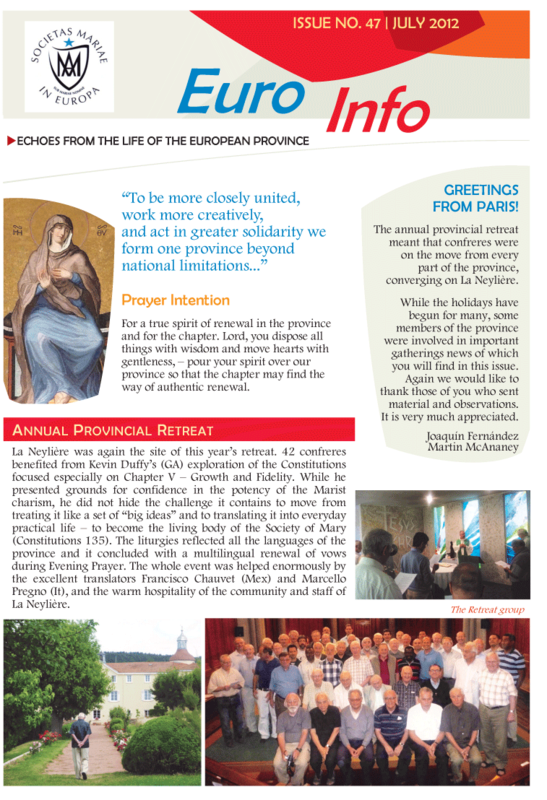 Aug 15, 2012, marks 200 years since an event influencing the foundation of the Society of Mary. On this day in 1812 a young man, Jean-Claude Courveille, experienced a call from the Blessed Virgin asking that a new religious family be formed bearing her name. They would be known as 'Marists'. 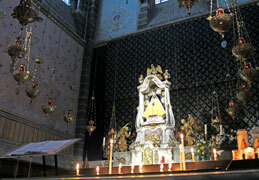 He had been miraculously healed of blindness some years before and returned on the Assumption feast each year to the nearby shrine of Our Lady in the cathedral of Le Puy in central France. 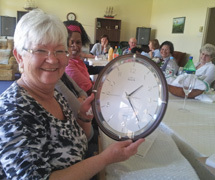 Courveille's sharing of this vision with fellow-seminarians in later years resonated strongly with that of Marist Founder, Jean-Claude Colin, who went on to make the dream a reality. 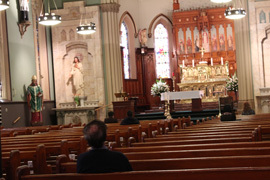 Below: The cathedral sanctuary is encircled with lamps. 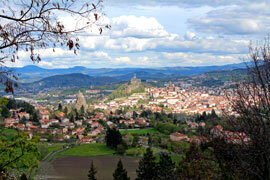 In Courveille's time pilgrims used oil from the lamps for healing. In a decision announced by provincial, Fr Paul Cooney, on Aug 10, Fr Peter McMurrich will become the next vicar-provincial of the Australian Province of Marist Fathers. Fr Peter has already served a 9-year period in this same office (1992-2000) and will take office again on Jan 01, 2013, along with the new provincial, Fr Bob Barber. 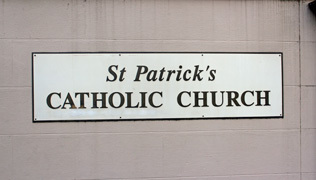 He is presently on the staff of St Patrick's, Church Hill, Sydney, as well as being archivist for the Australian Province. Congratulations, Fr Peter. 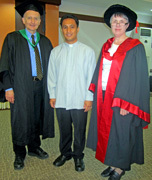 MMR director, Fr Kevin Medilo SM (centre) with ACU's online program director, Prof Duncan MacLaren, and Gail Crossley, Executive Dean of Arts & Sciences. 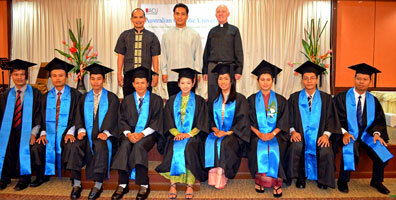 In a program initiated through the support of the Australian Marist Mission Centre in 2004, nine Burmese students from the Marist Mission at Ranong, southern Thailand, graduated on Aug 07 with diplomas from Australian Catholic University. 'In an impressive ceremony the nine graduated with a Diploma in Liberal Studies from the ACU. Present for the occasion was Gail Crossley, Executive Dean of the ACU Department of Arts and Sciences, together with Duncan MacLaren, the director of this course, and some other international friends. 'For the past 18 months these students have been studying the course on-line with the help of two local tutors, Andrew & Nuala Moraes, who are Marist volunteers from New Zealand. Internet technology enabled international collaboration. 'Professors from ACU, the Jesuit Universities of Fairfield, Gonzaga, and Regis in the USA, and York University in Canada, conducted specific units. In this way students from Burmese migrant work communities were able to study internationally from the Thai-Myanmar border where normally tertiary education would be impossible for them. Above: MMR team, Deacon Arnold Garferio, Fr Kevin Medilo and Fr Pat Devlin with the graduates. The ceremony filled a local convention centre with family, friends, government and religious officials. Below: Traditonal Burmese dancing. Back row, from left: Lauro Ferreira (Brazil), Paul Buleban (Vanuatu), Fr John Larsen (NZ), Daniel Fernandez (Spain), David Sanchez (Mexico). Front: Fernando Torres (Mexico), John Guo Wang (China), Fr Pedro Alarcon (Mexico), Fr Tony Corcoran (Australia), Dindo Calvo (Philippines), Xavier Sariman (Papua New Guinea), Jean Carlo Mujica (Peru). 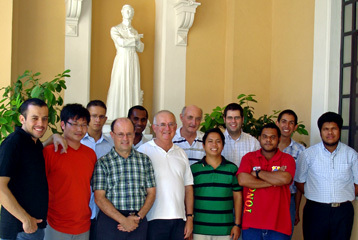 Near a statue of Oceania martyr, St Peter Chanel, at the General House of the Society of Mary, Monteverde, Rome, is the community of the Marist International Theologate with Australian, Fr Tony Corcoran SM (centre, front row). Superior of the formation community, Fr John Larsen, reports: 'Tony gave us a wonderful morning speaking on Christ as the Revelation of God ... quite profound and deeply personal at the same time. The young community is the most international in the Marist world comprising 13 members from 11 different nationalities: Brazil, China, Fiji, Mexico, New Zealand, PNG, Peru, Philippines, Spain, Tonga and Vanuatu. 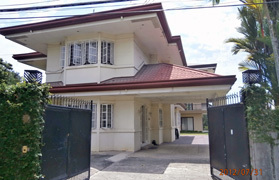 Asia-Pacific staff will lead the next Marist international novitiate beginning in Davao, southern Philippines in February 2013. Pictured below Fr Kevin Conroy (NZ) will be the novice master and superior, Fr Fernando Ingente (Phlippines) the socius and vice-superior and Br John Votaia (Oceania) will be the third formator on the team. In what is presently the central house of the Marist mission district of the Philippines in Davao City, Mindanao, a possible 13 candidates will make their novitiate. 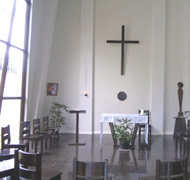 Above: The new novitiate chapel and Marist images. 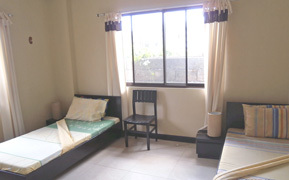 Spacious bedrooms. 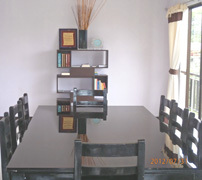 Below: Meeting room / kitchen. 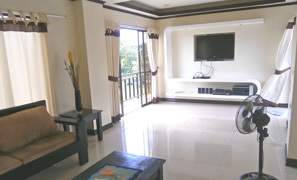 TV-recreation room. 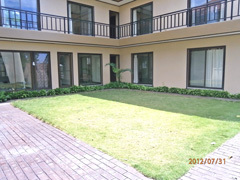 Courtyard. 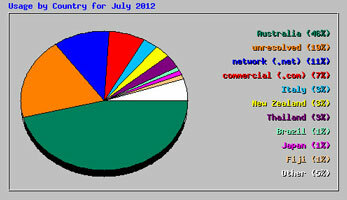 Our web site's intriguing statistics pages show a July return to more average visits from international sources. Visitors from 68 countries showed interest in maristfathers.org.au. June's extraordinary spikes (July news, 'June spikes') were occasioned by unexplained surges in visits from a total of 100 countries. Canada sourced the biggest spikes. 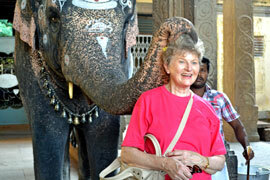 Over the past 12 months daily visits have averaged 241 (one visit every 6 minutes).